›Biblical Study, Easter, Historical Study, Pastoral Development, Scriptures›JESUS, IT’S YOUR FAULT… BUT IT’S NOT TOO LATE! Think about it: Mary is most often thought of as the more spiritual of the two sisters. Does this conclusion need to be re-thought? While Mary was at home in her deep grief, perhaps depression, Martha’s faith was growing. Jesus answered her: “Your brother will rise again” (John 11:23 NIV). It appears Martha’s faith then took a step backward and she answered Jesus with her rational mind. and not with the faith that was flowering in her heart. Perhaps she could not believe what had just come out of her mouth, so she changed her confession: “I know he will rise again in the resurrection at the last day,” she said to Jesus (John 11:24 NIV). Her logical thinking had zeroed in on the cold reality: Lazarus had been dead four days; death was surely final for her brother. This was all-the-more-true considering decomposition had already set in after four days. Nobody had ever heard of a person coming back to life after death, period; end of subject! Let it be underscored, however, that Martha was talking to Jesus, and faith had flashed in her heart to believe Jesus could do impossible things when He asked His Father. Jesus answered her, nudging Martha to leap in her confidence in Jesus to a whole new level of faith. “I am the resurrection and the life,” Jesus said to her. “He who believes in me will live, even though he dies; and whoever lives and believes in me will never die. Do you believe this?” (John 11:25-26 NIV). Dear reader, may I please challenge you with Jesus’ question: “Do you believe this?” – that Jesus in His own person is the essence of resurrection and of life – never dying eternal life? Wow! What authority Jesus holds. Martha made the leap of faith! “Yes, Lord,” she exclaimed to Him, “I believe that you are the Christ, the Son of God, who was to come into the world” (John 11:27 NIV). Amid all of Martha’s grief and pain associated with the death and burial of her only brother, Martha continued to believe with an open heart. In that very special and exciting moment, she stepped into the major league of divine truth and made the great confession of faith that Jesus is God’s Son. She, in fact, made the confession before her sister did. This declaration is all the answer needed, when fully assimilated, to heal a wounded heart with broken expectations. Jesus, it’s your fault, but it’s not too late! Yes, the Lord who experienced unimaginable pain on His cross sometimes uses sorrow and mourning to aid growth in faith. The eternal God who is love employs pain like a physician uses a scalpel in a surgery; a surgeon cuts out the problem to make recovery possible. With the Great Physician, His followers find new spiritual health amid their suffering and pain, and are routinely motivated to climb to a new level of faith. “I reckon the sufferings of this present time are not worthy to be compared with the glory which shall be revealed in us” (Romans 8:18 KJV). “Concerning this salvation, the prophets who spoke of the grace that was to come to you, searched intently and with the greatest care, trying to find out the time and circumstances to which the Spirit of Christ in them was pointing when he predicted the sufferings of Christ and the glories that would follow” (1 Peter 1:10–11; see also 5:1 KJV). 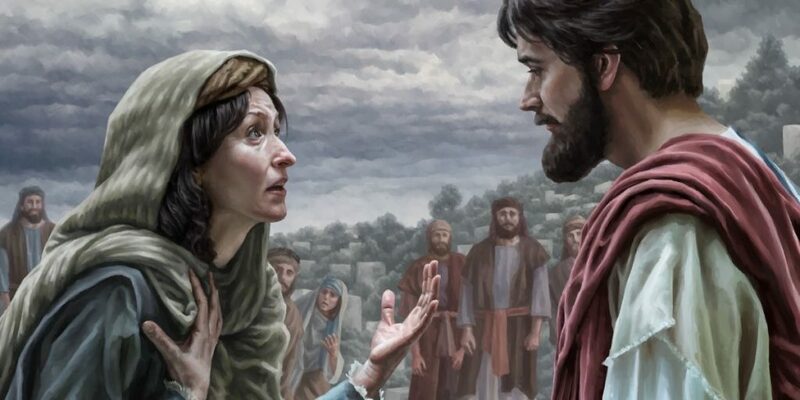 Martha had walked through soul-wrenching, aching grief those four long, lonely days after Lazarus’ death, before Jesus arrived back in Bethany. Our response to our suffering routinely determines if we will draw closer to Jesus, or walk away from Him. Martha chose to deepen her faith as her way of dealing with her disappointment that Jesus had not come on her timeline. Her choice meant she was beginning to discover the great meaning of agape love, the love of God. Think about it: When we have absorbed Jesus as the essence of all life, including resurrection life, how can the body of Christ ever endorse abortion on demand that legally ends life in the womb? It is unthinkable that Jesus Christ, who is “the resurrection and the life” would affirm such a choice.